I was cleaning a set of pistons this week end for a test stand engine I'm building out of spare parts. I've got a really nice 1917 block that's been rebabbited with a great crank etc... While cleaning a set of pistons, I found I had a complete set of Ford .0025 oversized pistons. I was surprised at the find. I typically scrap all the iron pistons and new look at them. For this engine to just sit on a test stand, I didn't want the expense of aluminum pistons so I'm using all good original parts. I even have a set of NOS rings for the project. I've still got to check the clearances as these may be too tight for the bore. 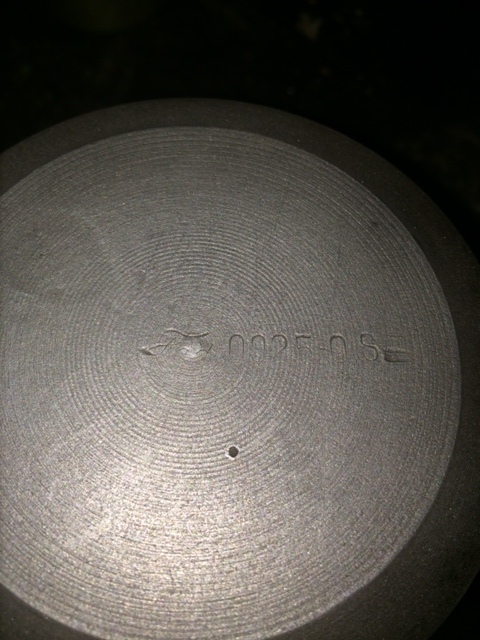 Here's a picture of the markings on the dome for the piston. Is the clearance built in to the piston or applied to the block? What is the diameter of the piston at the skirt? From what I understand with iron pistons the clearance is applied to the piston, whereas with aluminum the clearance is applied to the block, I am curious thanks Dave B.C. .0025 pistons are nice for those that like original iron pistons. Boring tools were not as precise that early, factories honed the final fit. I don't know for certain, but believe that Ford used the .0025 size on probably thousands of blocks that had minor mis-bores requiring just a bit more cleanup for proper fit. I know that they were also available after-market for minor rebuilds. Now they are nice because if you like them, and have a block with just a little wear in the cylinders, that little oversize can usually be enough to make a nice engine. You should use a rigid hone to clean up the bore as it will straighten out minor tapering for a better fit the full length of the cylinder. These pistons can be a nasty surprise also. Iron pistons only need about .0015 clearance to the cylinder to begin with. However if the cylinder has even a little taper, and seems to fit fine in the top. It could be a squeeze fit in the bottom and seize once the engine is started and the piston expands .001 relative to the cylinder. For those that don't know, the clearances for cast iron pistons are much tighter than aluminum pistons because their coefficient of expansion is the same as the cast iron cylinder. (Aluminum expands much more) However some clearance is still needed because the piston runs a bit hotter than the better cooled cylinder does, so therefore does expand just slightly larger due to the higher temperature. FYI FWIW, I like cast iron pistons. A few years age I purchased a 1926 roadster pick up. Upon removing the head I found pistons one and four were standard and two and three were 25 over. This engine appeared in remarkably good condition. It did not appear to ever have been opened. I believe this was a factory repair of a slightly scarred block. After all Henry would not have allowed it to be thrown away. I put another 26-27 engine in the car and still have this one. Perhaps in time will do a minor restoration and keep original. Dave, these pistons measured 3.7495-3.750" We know the advertised bore was 3.750 and I have the understanding that all engines had the actual bore listed and the pistons were undersized for the clearance. I've heard they were used for worn engines, that they didn't feel like reboring. My '13 touring had four of them when I bought it. This reminded me of a story Dad told. He put .005 over pistons in a model A when he was young, with out honing out the tapered bores. He said he could drive it all day at 35, but push it any harder, and it would begin to bind up. Yes, pistons were available in many oversizes, "back in the day"
If memory serves, Ford made OS pistons in the following increments. .0025, .005, .032 and .038. I still have a set of at least two, once had all of them. Also have Ford tapered rings for the .038, maybe others. Right now, the car I am working on has .0025. Larry, I assumed they were used for just that purpose. Read Ford Service Bulletins, look in the index under Pistons, sizes.